Video interviews, panel discussions, articles and Q&As featuring domain name auction. In today’s interview, Aron Meystedt describes valuation ranges not only for two- and three-letter domain names (e.g., AA.com, BN.com), but also for two- and three-number domain names (e.g., 16.com, 144.com). While DJI.com sold for $300,000 and 114.com sold for $2.1 million, both in July 2013, one is likely an outlier. Find out which in this interview. Also in this interview is an opportunity to sell LL.com, LLL.com, NN.com and NNN.com domain names through Heritage Auctions to their 800,000 registered users. Anyone who buys expiring domain names knows that there are three major auction sites on the Internet. But of the three, NameJet.com is the one that seems to get fantastic domain names on the most regular basis. 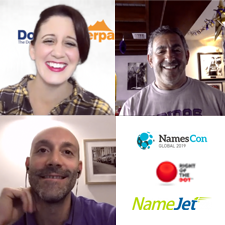 In this interview, NameJet General Manager Matt Overman walks us through how private auctions work and describes how you can take advantage of them too.